TMT engineers in the Monrovia laboratory close to TMT’s headquarters in California, after the installation of the first TMT Primary Segment Assembly (PSA) in the Multi-Segment Integration and Test Facility (MSIT). The bulk of the MSIT consists of the Mirror Cell Prototype (MCP), representing a subset of the mirror cell structure into which segments and their positioning systems are installed. The MCP will contain seven segments, about 1.5 percent of the total number in the actual mirror. 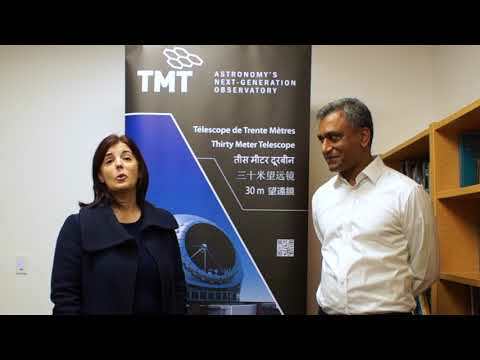 It is intended as a test platform to allow TMT the opportunity, as early as possible, to work with hardware that is a close approximation of what will eventually be installed in the telescope. The installed Primary Segment Assembly is composed of prototype components made by various contractors in India and the USA. The Indian TMT Coordination Center (ITCC) is responsible for the production of all 492 Primary Mirror Segment Support Assemblies (M1 SSAs). The MSIT structure is a section of the full mirror cell, designed by Mitsubishi Electric Corporation (MELCO) and fabricated by Hitachi Zosen in Japan. For more information on the MSIT, see the previous article “Major Milestone for TMT Multi Segment Integration and Test Facility”.